My name is José L. García-Morales and I am a Professor in the Environmental Technologies Department at the University of Cádiz (UCA). 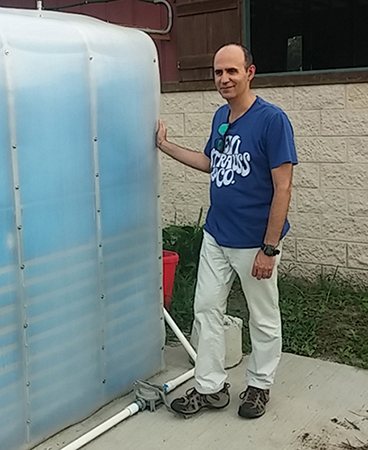 This June-July 2018, I have been a Visiting Research Scholar in the Soil and Water Sciences Department at the University of Florida in Ann Wilkie’s Bioenergy and Sustainable Technology Lab. One of the objectives of my stay has been to explore the establishment of a possible cooperation framework between both universities in terms of academic and research activities. My university is one of the public universities of the south of Spain, in the southernmost region of Europe, Andalusia. This is a medium size university and has around 22,000 students in four campuses distributed within the province of Cádiz (http://www.uca.es/?lang=en). In this province is the Strait of Gibraltar, one of the most important geographic and geostrategic points worldwide. It represents a bridge between seas (Atlantic and Mediterranean), between continents (Europe and Africa), and between countries (Spain and Morocco), and it is one of the busiest shipping routes. In addition, in this province is the area of ​​production of Sherry wine, one of the best-known wines in the world. One of the areas of my research is technology for managing different by-products and/or wastes that are generated during whole industrial processes. In our current way of life, in most of the developed countries, people are not aware of the connection between raw materials, processed products and wastes. Few people know where their waste goes, its value and the real cost of its management. By-products and/or wastes are some of the environmental externalities of all the industrial processes, and the citizen/consumer does not have a clear vision of the actual problem. The circular economy concept has been widely discussed and analyzed in recent years and has rapidly gained credibility in the waste and resources sector. The core vision of the circular economy is of replacing the current largely linear economy of ‘take, make and dispose’ with one in which resources circulate at high value, avoiding or reducing the need for virgin resources. However, the more visionary aspects of the circular economy, involving new product lifecycle supply chains and new business models focused on the elimination of waste in the traditional sense, could bypass the waste and resources sector in its current form. Currently, some of the research in organic waste management and treatment of our research group at University of Cádiz (Spain) implies the concept of circular economy. The concepts of organic by-products and organic wastes are very close. Sometimes, the border between both concepts is only a legal point of view or bad management practices. An example of our research with an organic waste/by-product in Spain is shown below. The olive (Olea europea) is an evergreen tree traditionally cultivated for the production of oil and table olives. On a global scale, olive oil production in 2014 exceeded 3,050,000 metric tons, mainly concentrated in the Mediterranean Basin, with Spain being the main producer (1,738,600 metric tons, 57%) followed by Italy and Greece (FAO, 2018). One-third of the total world olive oil production is concentrated in Andalusia, a region in the South of Spain. Hence, this area is especially affected by olive-mill waste pollution. However, many other countries such as Argentina, Australia, South Africa and the United States of America are becoming emergent producers since they are promoting intensive olive tree cultivation. World consumption of olive oil increased by 1.8 times between 1990/91 and 2015/16 (https://www.oliveoilmarket.eu/trends-in-world-olive-oil-consumption/). There are different standards for olive oils in reference to the method of obtaining, broadly speaking mechanical-physical (virgin olive oil) or chemical-solvent extraction (olive pomace oil). The production of olive oil is characterized by significant amounts of solid wastes and by-products and liquid effluents, and their management is a challenge for the olive-mill operators from both economic and environmental perspectives. The amount produced and characteristics of solid wastes and liquid effluents differs according to the technology applied for the extraction of olive oil. Two basic oil-extraction technologies are applied, namely the traditional pressing and the centrifugation method. Traditional pressing was applied for many centuries. However, in the last decades three-phase and two-phase centrifugation processes have been applied by the majority of olive mills. Regarding two and three-phase centrifugation, the oil yield produced is similar, but there is a significant difference in the amount and the composition of solid and liquid residue fractions. The three-phase centrifugation system generates three fractions at the end of the process: a solid residue fraction called olive husk or olive pomace (Three-Phase Olive-Mill Waste – 3POMW), and the oil and wastewater liquid fractions. However, from the early 1990s, the implementation of a new extraction system (two-phase technology) in some countries has introduced a new solid waste, called two-phase olive-mill waste (2POMW), with specific management problems. This solid/water mixture residue is suitable for subsequent residual oil by chemical extraction and drying for energetic use. The production of large quantities of these by-products, especially in the 3-4 months of intensive oil production, and the variability of the waste composition are the main problems in residue management. An analogous situation also happens with organic solid by-products of table olives, but in this case this is not a seasonal residue, and some of the alternatives for their management could be similar. This is one potential area of research collaboration that I am interested in pursuing. During my stay here, we visited a closed landfill of Alachua County and its pilot facility for leachate treatment by reverse osmosis. We took samples of different streams of the process (concentrate and permeate from different stages) and measured several parameters (pH, temperature, electrical conductivity, etc.) in situ. The problems with landfill leachates are similar in both countries, and to a greater or lesser extent the technologies for its treatment are similar. Visiting the landfill to collect leachate samples. The facility operators were very interested in the treatment of leachates by reverse osmosis at full scale applied in a landfill by a Spanish company (Verinsur). This company has sponsored the Company chair of “Environmental Research and Technology” (UCA-Verinsur) at the University of Cádiz for more than three years, and now we are developing together a research project about the possible reuse of the reverse osmosis permeate from their leachates treatment in the company facilities. We were also able to visit the Alachua County Solid Waste & Resource Recovery Department to present my experience in municipal solid waste and leachate treatment, and learn more about the waste management in the county. Often, the problems with municipal solid waste management and the lack of awareness of citizens and politicians are similar regardless of the countries. Another potential collaborative line of research is the application of Life Cycle Analysis (LCA) as an instrument to evaluate different management alternatives. I learned about a case study of LCA at the Bioenergy and Sustainable Technology Lab involving the management of the invasive aquatic plant (Hydrilla verticillata), taking into account also the aquatic plant control, nutrient remediation and habitat enhancement. This perspective is very interesting because it not only assesses the possible management alternatives of harvested plants (composting or anaerobic digestion), it also takes into account the ecological benefits of this management. Visiting the biodigester in Alachua. The foot pump provides mixing by circulating the biodigester contents. A further exposure to the lab’s research was in relation to the diversion of food waste for anaerobic digestion and the use of small biodigesters at rural areas for this purpose. 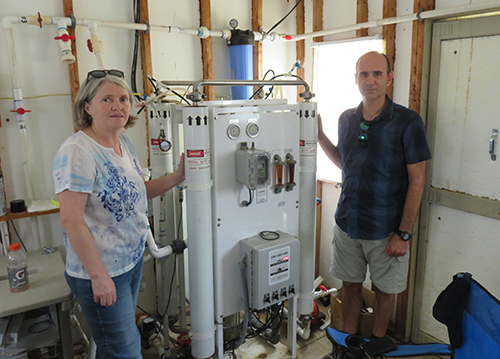 We visited a biodigester they installed at a Hare Krishna community in the north of Alachua County. This alternative for organic waste management at small farms or in rural communities is very interesting and allows the use of generated biogas for cooking or heating. The use of small digesters could be an available source of energy in rural areas in developing countries and could be exported to countries of northern Africa or Central America in which the UCA has cooperation projects. The food waste and, in general, the management of the organic fraction of municipal solid waste is another potential area for our research collaboration that I am interested in pursuing. In our research group (http://tmagroup.es/), we have a lot of experience in the application of biological processes (anaerobic digestion and co-digestion, dark fermentation and composting) to this kind of waste. Throughout my stay, I have been analyzing the possible common lines of research and similarities in undergraduate and graduate studies with my Faculty at the University of Cádiz (http://ccmaryambientales.uca.es/english/). There are several possible common academic and research interests between both institutions, mainly in the Environmental and Marine Sciences fields. Now we are exploring advances in possible collaborations that we hope will come to fruition.